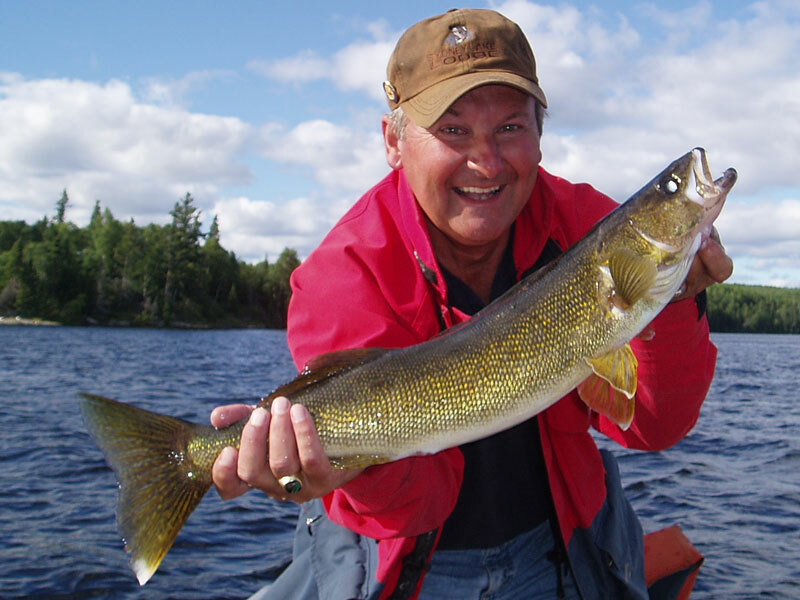 Walleye fishing was our great grandfathers favourite pastimes, In the 1930's he flew across Northern Ontario looking for the best walleye fishing lake. He found Sydney Lake. 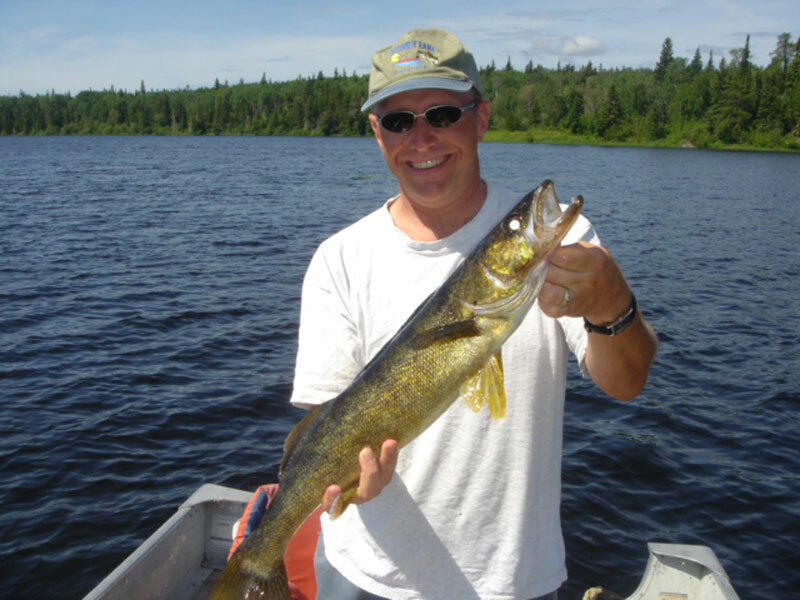 Walleyes are a great fighting fish, famous for their fast hard fight. Here the fight is better than most places and we are constantly asked why? - government fisheries scientists have stated that likely it has to do with having both shallow waters and large deep pools. The numbers that your group will catch is likely in the hundreds, catch many more with good technique and spending more time on the water. Daily many catch over 50 per day and some catch 100 or more per person in a day. We recommend a golf stroke counter if you would like to keep track. The average catch is about 2 1/2 pounds, but this can very as many schools of fish that you run into will have a larger average size of 3 1/2 pounds. You can literally fish until your arms get sore. A trophy walleye is 27 + inches, many are caught and released every year between 27 and 30 inches, that's 7 to 10 pounds - but better still their are bigger walleyes yet that are caught every year over 30 inches - the biggest walleyes for the season are in this class and range from 10 to 14 lbs+. 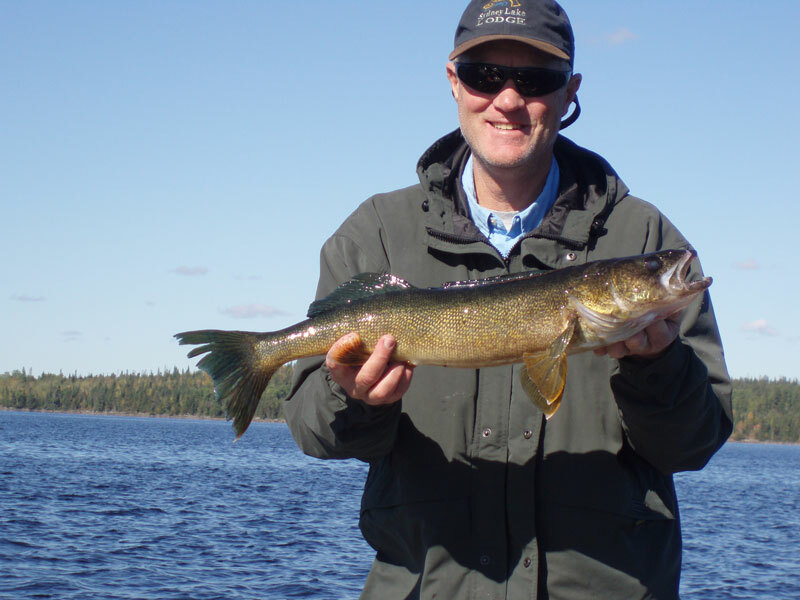 The opener in May to the end of September the variety of structures, deep and shallow waters as well as both clear and dark waters is the perfect environment for a very healthy walleye population - you can come on up and hammer the walleyes when you want to. 16 foot Lund boats with 20hp four stroke motors with electric start will get you to where you want to go quickly but still troll down to a slow even pace, which is very effective for catching lots of walleyes. The type of motors is also selected because they will run at a troll all day without fouling up like 2 stroke motors. They are also more fuel efficient than 2 stroke motors and friendlier for the environment. Walleye is great eating and the fish here is 100% organic. 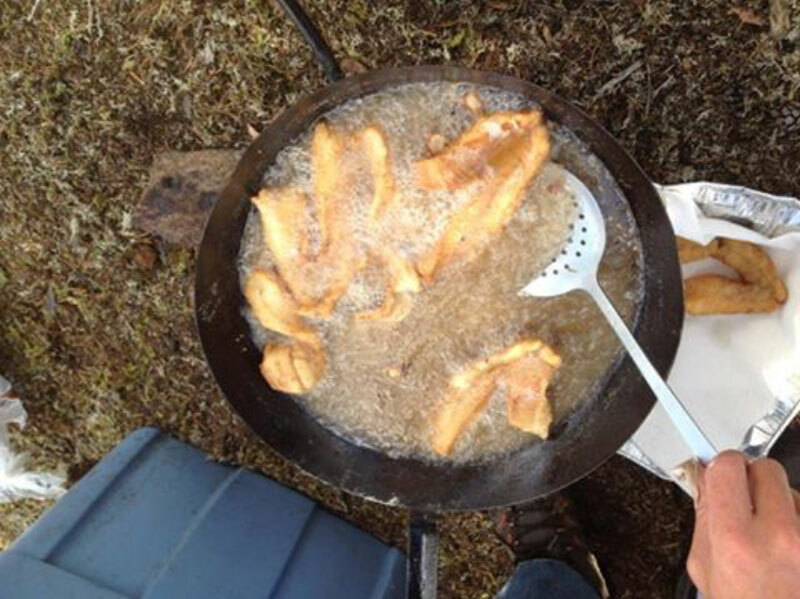 Fresh walleye tastes so damn good and its good for you. Shore lunch is a great experience and all of our cabins have kits with pots, pans, racks and utensils as well as propane cookers and fuel ready at the boat dock. 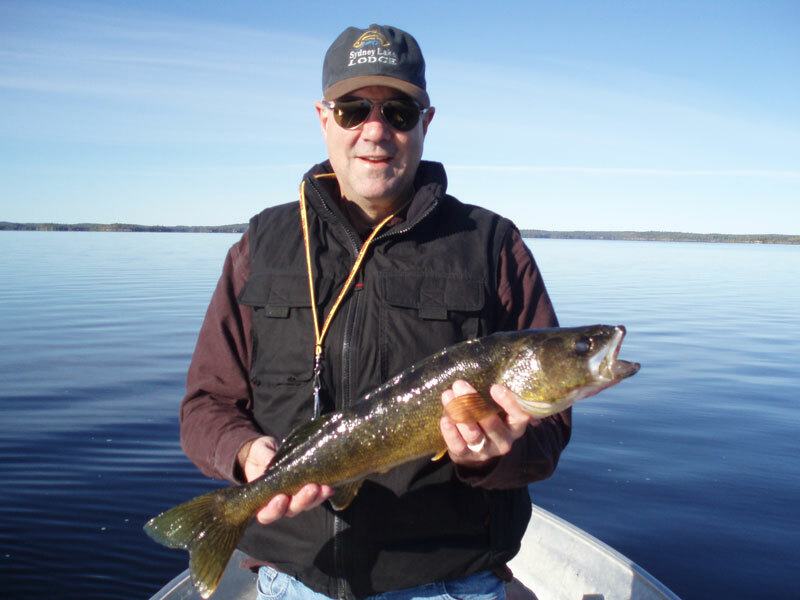 Walleye fishing is nothing short of spectacular on Sydney and Kilburn Lakes. Years of conservation fishing and the policy that all trophy sized fish are to be returned has kept this fishery very healthy and a thrill to experience. The fish are here, come and catch them there's lots of em and there big. All natural, there is no stocking on our lakes the high quality fishery is as nature made it, we are near the headwaters of our lakes and river system and there is no upstream development and never was, that means no pollutants - it also helps to have a remote location and a very long standing conservation policy. All of the fish shown on this page have been released alive and are now bigger and waiting for a tasty treat. 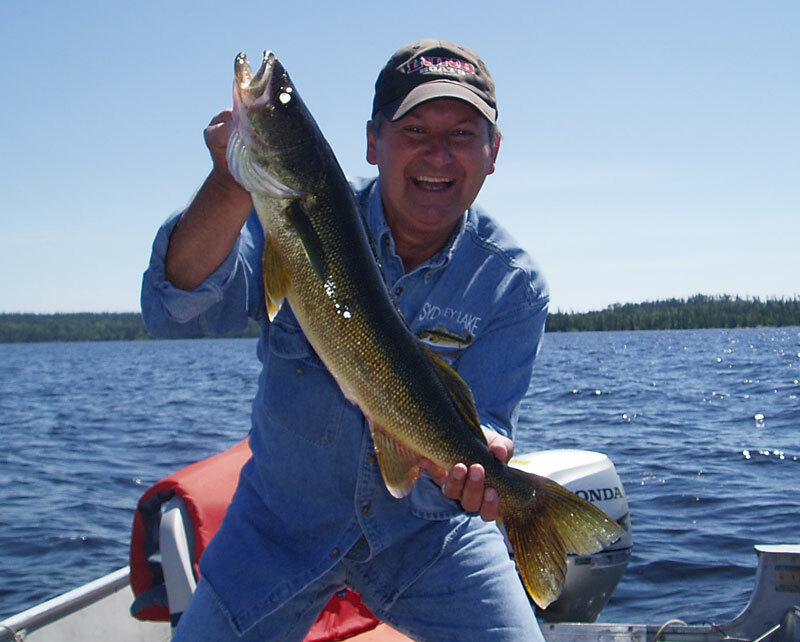 Walleye fishing trips in Northern Ontario - The way fishing in Canada should be! 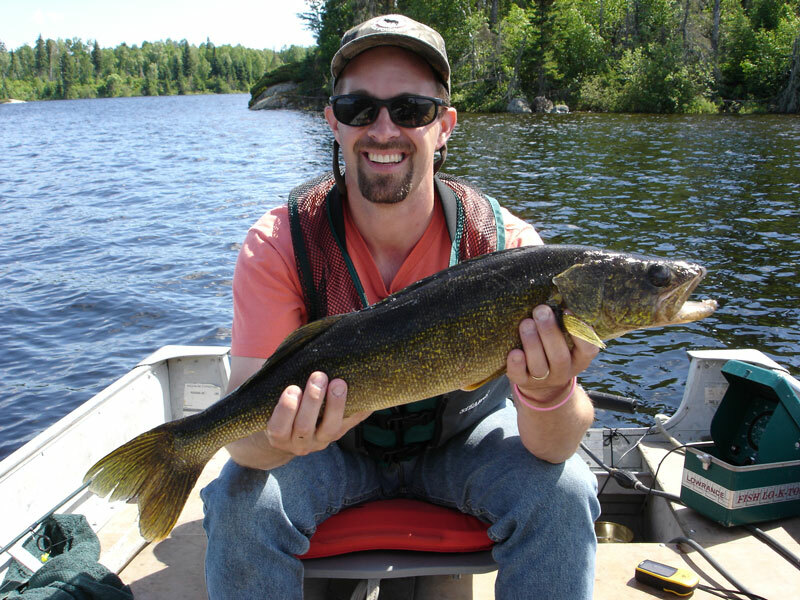 Catching massive walleyes in the spring is exhilarating with that cold water and extra fight. The best results over the years have beet from two methods. The first is crank baits - think rapallas and rattle traps. both casting and trolling often where the shallow water meets the deep. When you have some good action in a spot try a few casts with a rapallla towards deeper water. The second method is to go big and go deep - try 1/2oz to 1 oz jigs with large baits in 25 to 30 feet of water throw on big double tails of the largest rubber worms you got. Jig it and troll it 25-100 feet (make sure the depth is not more than about 35 feet) from where the break to deeper water is. The Ontario Walleye Opener for 2011 is on the Saturday the 21st of May. The ice goes out on Sydney Lake on the average year between the 25th of April and 10th of May. During the walleye pre-spawn, spawning and post spawn the fish populations are the most concentrated that you will see all year. The date of the opener is set to coincide with the approximate completion of walleye spawning - and is when the "bite" really gets on. The camp is open on the day before the walleye opener on Friday the 20th of May. Fly-in on Friday or Saturday morning - you pick the time and get prepared for the morning of the first day of the season. The walleye spawn soon after ice out, when the water temperature warms to about 40F. Pre-spawn walleyes hang out in about 25 to 30 feet of water and move shallower to spawn. Walleyes are the last fish to spawn and will travel to upstream areas including creeks and bays. There they look for rocky or gravel areas to lay their eggs. Walleyes from all over the lake will concentrate in the best spawning areas such as Mineral and Hansen's Bays and have the heaviest concentration of fish in the 3 to 10 foot depths. Not all fish spawn at the same time - the spawn is spread out as water temperatures range from 40F to 45F. The peak spawning time each day is from dusk until midnight. As dark water warms quicker than clear water, and shallow - faster than deep, the walleyes will be in different stages on different parts of the lake. 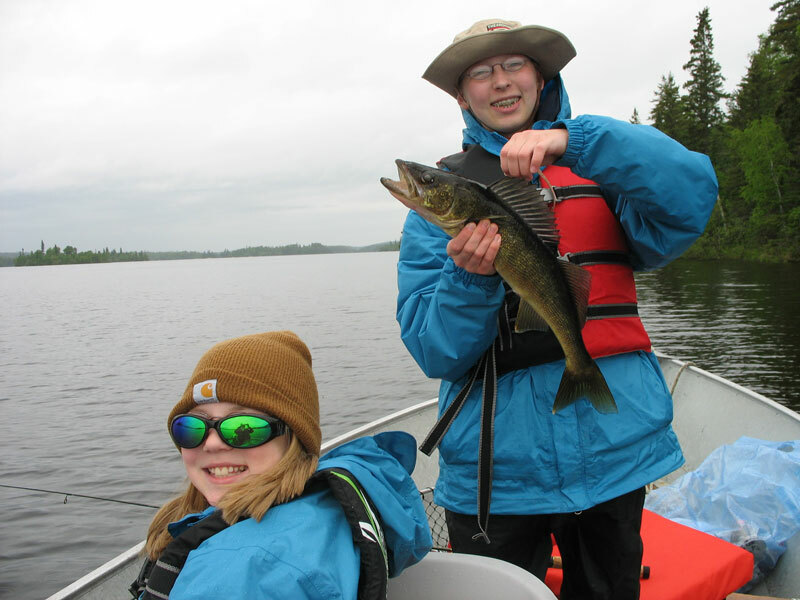 Fishing Walleyes in May the first thing you want to know is what's the water temperature? The magic number that you are looking for is 50 F. That's the temperature where the walleyes really become active. The water temperature difference between the camp and dark shallow bays is often about 10F. Since weather can very from year to year and affect ice out times a few tips will make it faster to get good action fast. Pre spawn walleyes are found deeper at 25-30 feet. They will be close to streams and rocky areas. The fish will be in large concentrations and feeding actively, jigs and crank baits work best. During the spawn the fish pack into shallower water usually at the end of the day - evening fishing works best - look to work the edges of incoming creeks and shallow areas where new cabbage is starting to grow. Wind direction can affect water temperatures in bays and inlets and remember to check the temperature a few feet below surface as there may be a significant difference in just a couple of feet. After the walleyes have spawned they are really hungry - they must replace all the energy that they have expelled, and are packed in heavy concentrations. 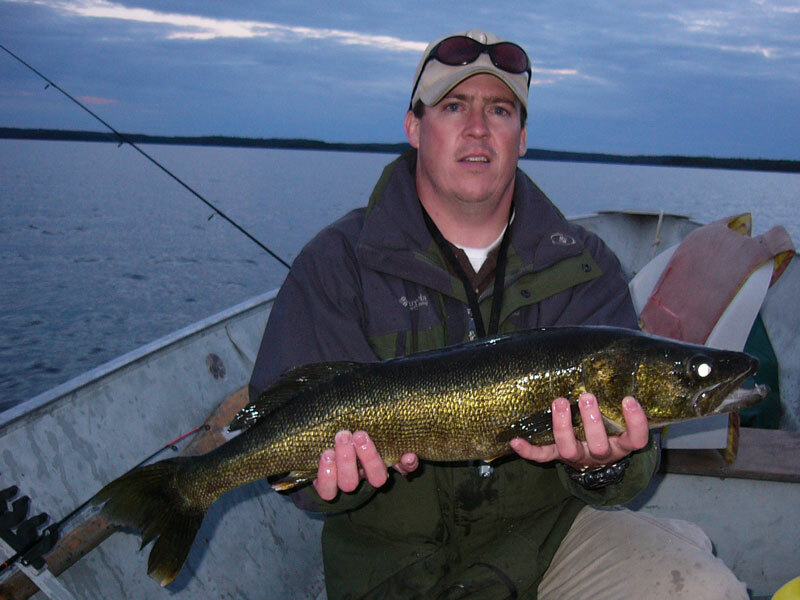 When you take your first spring walleye fishing trip to Sydney Lake you will be hooked. Sydney Lake has over 120 miles of Shoreline including numerous dark water bays. This is where the action starts in the spring. The walleyes spawn in early may after ice out. After they have spent all that energy, they are hungry. I'd like to point out a couple of my favourites. Mineral and Tranquility bays at the north end of Sydney Lake are quite shallow and both have creeks running into them, this is perfect conditions for spring, these bays teem with walleye in June and into Early July. These are great places for 50 to 100 or more walleyes per day. I got to tell you it makes your arms sore. Hansen's Bay is another Hot spot, there is a large flat area when you enter the bay, beside a small island. the question is how fast can you catch them. another great spot is Boot Lake. in years with high water (most years lately) you can drive your boat up a wide creek from the entrance of Bottle Bay to a narrow rock cut and into boot lake (no portage). In the creek at the bottom of the rock cut and at the far end by a small waterfalls. Boot Lake has dark water and its shallow. The water heats up fast and in late May and Early June this makes the walleyes active, especially in the early evening. At the waterfall it is fun to cast one way and get a walleye and the other for a Pike. Oh yeah - there's big ones in here too. We can mark these and many more spots on your waterproof lake maps along with great Northern Pike, Lake Trout and Shore lunch spots. 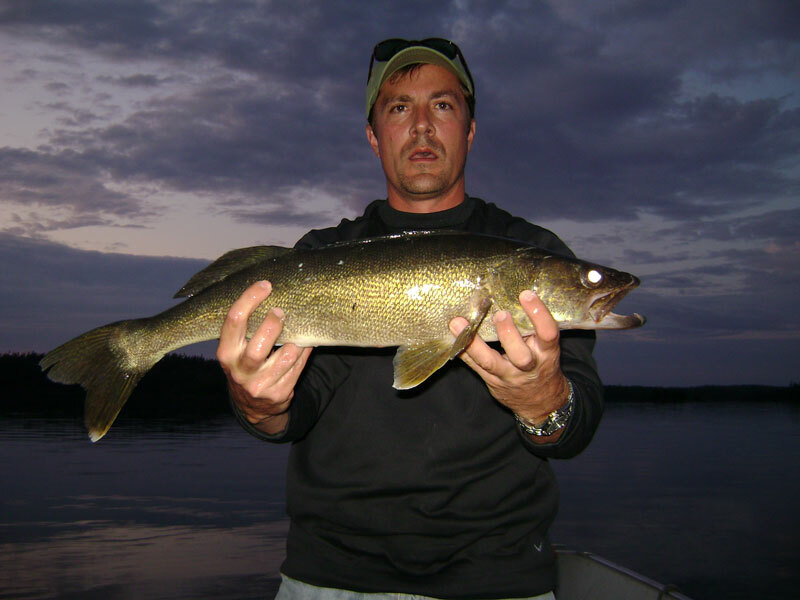 Spring walleye fishing is usually quite shallow with depths of 3-8 feet on average. Make sure you check the water temperature as this is key to predicting the walleye activity - 50F - 53F is where you want to be. Protected bays, creek mouths and small lakes like Boot Lake are the most active. The trick to catching lots of walleyes is to keep your line in the water - this means quick release of the fish - barbless or pinched barbs work best. Single hooks only and a handful of jigs is your best bet. You can catch fish after fish here for hours as long as you keep your line in the water and stay on top of the large schools. 1/8 to 3/8 oz jigs are recommended with minnows, twisters or other artificial baits. Anchoring is recommended while jigging or try trolling in tight circles with spinners. All you do to find the fish is to start to troll down the shore - all of a sudden - WHAM you get one, then your partner, and again and again. This is when you stay put - fish hard and enjoy. Our friendly staff will be pleased to mark your waterproof fishing maps where these spots are. July walleye fishing starts off the same as June, hard action in shallow water. Dark waters start to warm up fist and depending on weather conditions and water temperatures, the walleye start their transition to structure, sunken islands, deeper water, and faster moving water. Some spots like the narrows into Kilburn Lake remain hot with the walleyes shallow throughout July. The water is dark here but the current brings in lots of baitfish. Walk 200 feet across the portage to Rowdy Lake (especially on a clear calm afternoon), fish from shore below the falls and watch the fish attack your bait. 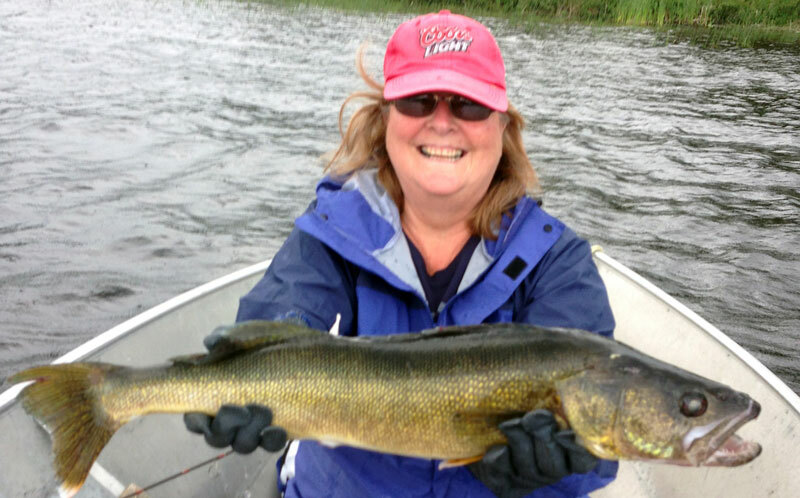 During July and into August the Walleye action heats up and Trophy Fishing gets better. There is a great reef in the West Arm of Kilburn Lake that has shallow water on one side and deep on the other. on "the break" is where the walleyes. For Trophy Walleyes August is the best Month. The Walleyes have made their transition to deeper water and reefs are the kings of Trophy Walleyes. The Finger Reefs, The Gap and Blood Brothers Islands are prime examples. They are located a few minutes from camp on Sydney Lake. The finger reefs and reefs off of Blood Brothers Islands fall into deep water fast. The best thing is the size of fish that you catch, fish after fish. The Gap Is an interesting area as it is the Wide mouth of the Sturgeon river where it flows into Sydney Lake. The Gap is a ridge that gets as shallow as 5 feet is the size of three football fields and has deep water on both sides. 80 feet deep on the river side and 200' on the lake side. 15-22 feet deep here is the sweet spot with structure (drop offs) the best places. The best depth to fish is 18 -25 feet. jigging, drifting and trolling. 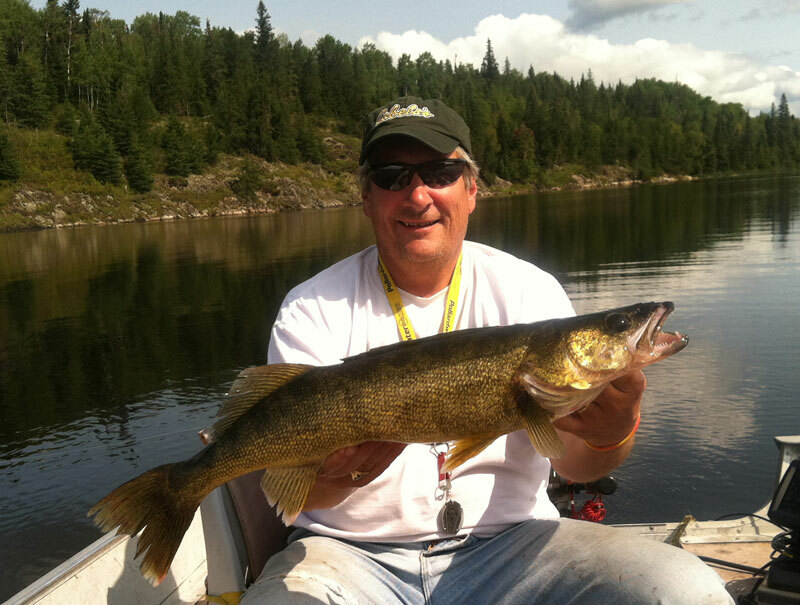 July and August walleye fishing when most trophy walleyes are caught. The transition happens sometime in early to mid July and depends on temperatures and weather patterns. In July the fish move to deeper waters 12-18 feet. Reefs and structure off shore and islands offer the best results. The walleyes are still in large schools at this time and may "come up to feed " into shallower water at dusk. If its a windy day the fish may be pushed into shore on the windy side of a bay or deep on the calm side. Pink and white as well as gold and orange and chartreuse are the best colors. Jigging in the morning and evening and back trolling with spinners during the day. A depth finder can be helpful to stay on top of a school and to find the breaks and structure. We have depth finders available at the camp. 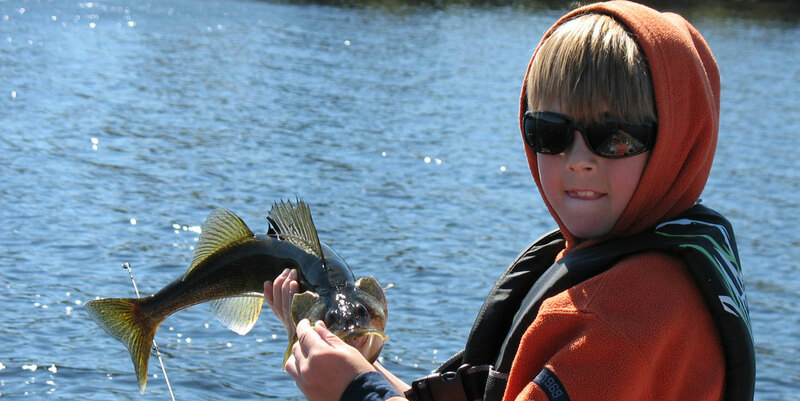 On bright days on the main lake you can spot the walleye schools, so polarized sunglasses are a must. The biggest trophy walleye come off of big water on sharp cuts, sunken islands are best fished "on the cut" where the depth suddenly drops off. 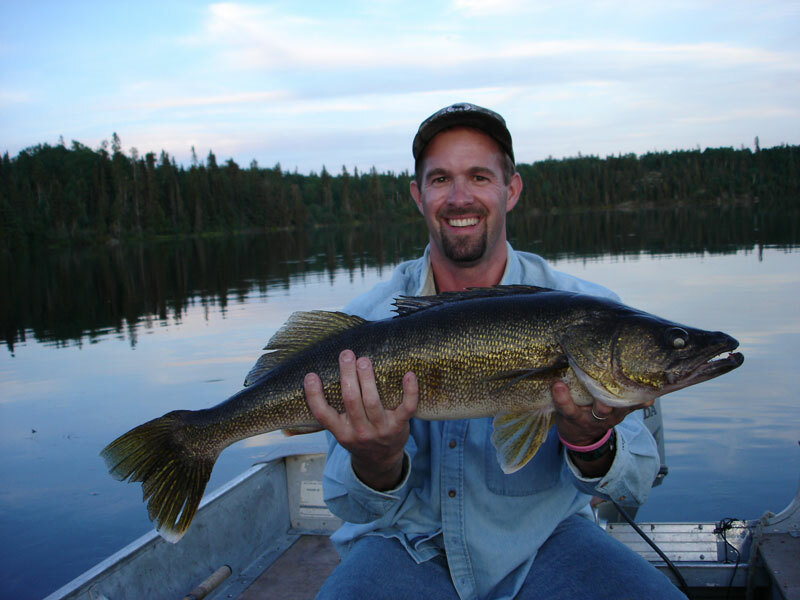 With the average depth of Sydney Lake being 65 feet there is lots of Walleye action at deeper levels too. 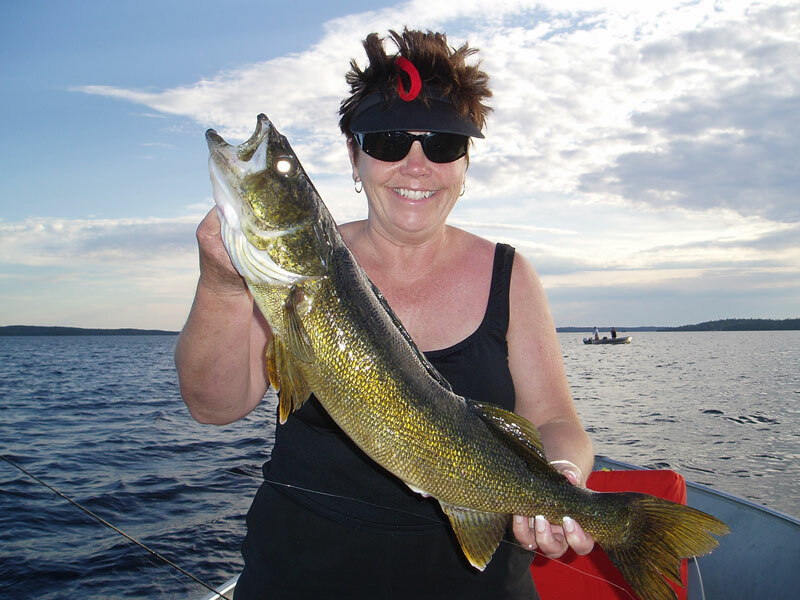 Fishing humps that are 50 feet deep can often be filled with walleyes as well as Lake Trout. 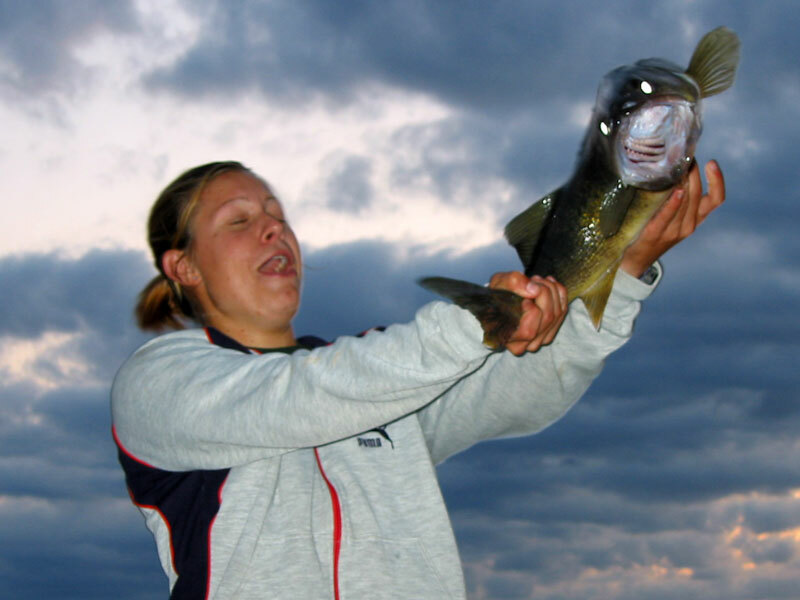 The best times of day to fish are mornings until about 1:00pm and evenings after 5:00pm. A good strategy is to fish mornings and evenings and relax or go swimming during the afternoon. It gets dark about 10:30 in early July and about 9:30 in late August. September Walleye Fishing is nearly the same as august with the fish Deep at 15-30 feet and flats and narrows heat up. the chute through the islands to the south side is a great example. This is a narrows between 8 and 25 feet deep with deeper water on the south side. The walleyes sit on the flats on on the cut waiting for a meal. During the last week of September the Fall fishing is a blast with spots like this you can catch walleye, pike and lake trout in one spot, I mean you don't even need to move 10 feet to catch them. About 1000 yards from the narrows in Kilburn is another spot, this is a large flat area near a large island 22-26 is where the fish are at, back trolling real slow, even into the wind works best. At the end of the West Arm of Kilburn is one of my favourite spots, there is high cliffs here and several islands. Fish off of the rock cuts and in the narrows between the islands and shore. There are three fabulous shore lunch spots to use here in a small area with fantastic views. Fall fishing is a little different, follow these guidelines for maximum results. First get deep and on the bottom. the best average depth range is 18-25 feet. Drift slow or back troll slow. Slow moving targets are best. Pink and white 1/4-1/2 oz jigs and a good sensitivity rod. Lift your rod slowly when you feel a bite and give it a good tug to set the hook when you feel the weight of the fish is there. 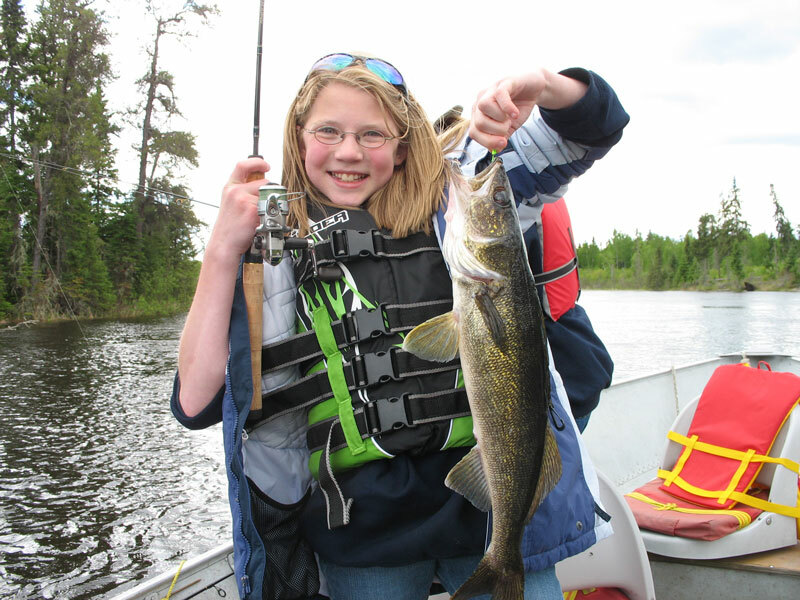 A depth finder can be helpful to spot areas with lots of fish - but don't be fooled walleye often sit right on the bottom and might not register on your depth finder. 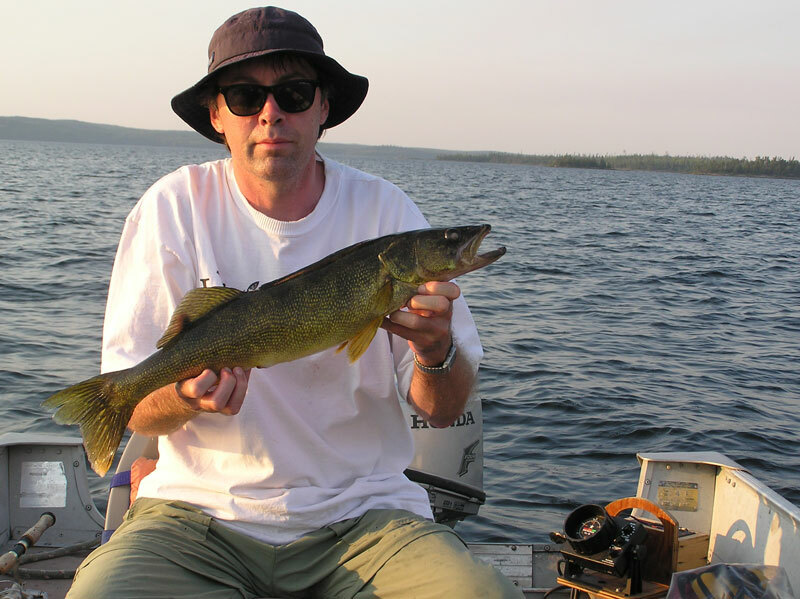 The best walleye fishing tip is that walleyes are usually found on or near bottom. Jigs and spinners with twisters, artificial grubs or minnows works best. Now let me give you some really good walleye fishing tips. First the walleye are found at the bottom- not in it. Drop your bait to the bottom, bounce it a couple of times, lift it an inch or two off the bottom, now sit tight for a few seconds. Its this action that will attract the fish and cause them to bight. I have literally caught thousands of walleye using this technique. sometimes the fish are not right at the boat, they are a few feet away. Now is the time to cast. Cast 10-30 feet away to where the fish are let the lure sink to the bottom, when it hits let it sit there for a second, then reel in a couple of cranks, then let it sit again. This slow start and stop retrieval gains excellent results. It is perhaps my favourite technique and usually combine it with the first technique when the fish are active. This information can be quite helpful especially if your group is having a walleye fishing tournament. The right walleye fishing equipment can help you catch more fish. Fishing rods should be medium or medium light action and from 5 to 6.5 feet long with good sensitivity. Fishing reels recommended are open face but some prefer bait caster reels. A fairly stiff rod with good sensitivity gives you good control for setting the hook. The best walleye fishing lures are a mixture of round head jigs in sizes 1/16 through 3/4 with the majority being in the 1/8th to 3/8 ounce weights. Colors include plain, orange & chartreuse, orange, pink & white, yellow, white, pink, red and black. Jigs can be used with all live bait or twister tails. Use as light a line and weight as possible for best results. Use heavier weights on windy days. Get these babies to the bottom and bounce them there - that's where the walleye are. The Rapala Original Floating Minnow, the Husky Jerk, and the Shad Rap work best. The Shad Rap is possibly the best producer of trophy walleye . Little Jo's and lindy rigs work best. Blades in all the hammered such nickel, gold, copper. Chartreuse, orange, pink, yellow, and combination metal / colored. Vary the sizes. These work best when trolling. tip them off with a minnow or twister tail. These fishing lures should be a staple of your fly-in fishing trip to Sydney Lake Lodge. Website made by Jeb Fahlgren - Check out my other sites - Alaskan Fishing Games, The top fishy poker sites, 2017 US poker sites and the best Canadian poker.